I spoke on the Bishop's Appeal at Down and Dromore synod 2016. The short speech is below. Jeody Luckmane is 28, he is a farmer from Haiti. His home was destroyed by Hurricane Matthew on 4 Oct. In a UNICEF blog he said, “I do not know what we will do now. Everything is destroyed. There is nothing left. There is no food or water, and children are starting to get sick,” A cholera epidemic is looming on Haiti, 1.3 million people are in need of food aid. News like this saddens us, almost to despair. What can we do? I would like to encourage each one of you to give to the Bishop’s Appeal emergency relief fund for Haiti. I would also like you to understand that Church central funds, and your pension fund, are being invested in fossil fuel companies that are the major cause of carbon dioxide pollution and climate change. Global warming is making the impact of hurricanes like Matthew worse. Why is the engagement with oil giants wrong? The Church of Ireland acknowledges that a transition to a low carbon economy is essential to help mitigate global warming. Its policy on climate change is based around collaborative engagement with fossil fuel companies. 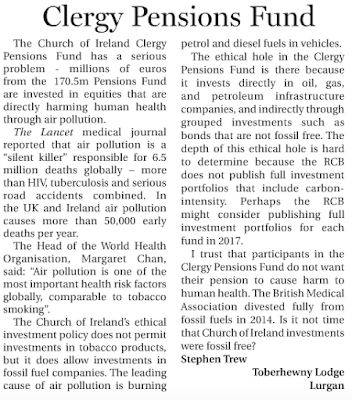 This means that through its membership of bodies such as Church Investors Group and the Institutional Investors Group on Climate Change, the church can engage with fossil fuel companies with the aim of encouraging them to reduce exploration, production and emissions from fossil fuels. The problem is, engagement is not working. 1. Years of experience shows engagement is not working. 2. We need rapid change, not a gradual shift. 3. Investing in fossil fuels is unethical. Let’s take each of these arguments in turn. Archbishop calls for a mission audit. How does the church itself measure up? The Archbishop of Armagh has challenged us to do an ‘audit’ against the Five Marks of Mission, but how does the Church of Ireland measure up? I was very pleased to read that the Archbishop’s presidential address at Armagh Diocesan Synod was about the Five Marks of Mission. 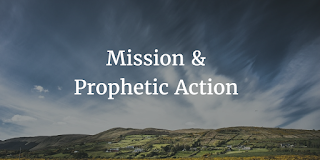 They are an important statement on person evangelism – for they came out of an Anglican Consultative Council on personal evangelism in 1984 – and they demonstrate that holistic, integrated missions is key in the Anglican Communion. Hurricane Matthew was the first category 5 hurricane in the Atlantic since 2007. Several countries were impacted but Haiti, receiving a direct hit, suffered catastrophic damage. Over 1000 lives were lost, fifty thousand people are in immediate need of clean water and shelter. The UN World Food Programme has arranged to feed up to 300,000 people. There is also fear of a cholera outbreak. Damage in Haiti, the poorest country in the western hemisphere, is estimated to be in about 1 billion dollars. The Church of Ireland Bishop’s Appeal has responded to this disaster by joining with Christian Aid and highlighting the Haiti emergency appeal. You can give online at the appeal website. 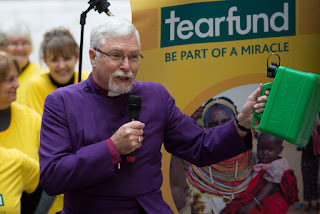 Christian Aid and Tearfund both encourage churches to do more for suffering people. This means responding to appeals for disasters and working to tackle the root causes of those disasters – like climate change. 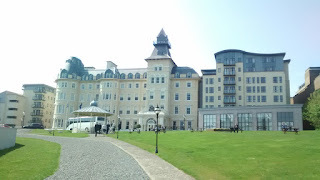 Parishioners from Down and Dromore Diocese will join with Bishop Harold Miller to ‘speak up’ for the people, places and things they love that will be impacted by climate change. 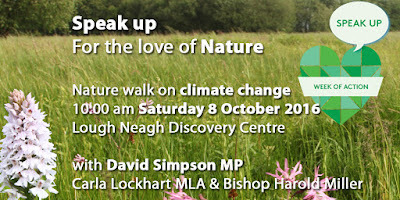 They have planned a nature walk in association with the Climate Coalition on Saturday 8 October to let David Simpson MP know they care for creation. The 1st of September is 'World Day of Prayer for Creation' which is now supported by the Anglican, Roman Catholic, and Orthodox churches as well as the Word Council of Churches (WCC) - basically all corners of Christendom. Which bishop will speak up for climate justice? This week a major report into the ‘State of the climate’ for 2015 was published by the National Oceanic and Atmospheric Administration (NOAA). It was sober reading. 2015 saw many climate records broken. It was the warmest on record globally, with surface temperatures now +1C above pre-industrial levels, the oceans reached new record temperatures, and sea level rise is at historic levels with oceans now 70mm higher than the 1993 average. Furthermore, atmospheric CO2 crossed the 400ppm threshold and is more than 43% above pre-industrial levels. Each of the last 14 months has broken previous temperature records. A report by the International Energy Authority (IEA) states that air pollution from fossil fuels has become a major health crises and is responsible for 6.5 million deaths worldwide each year. 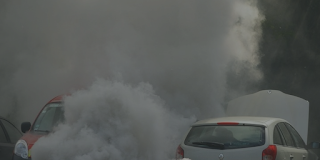 The report states that the problem of air pollution is growing and the health impacts risk intensifying in the decades to come if nothing is done. In 2015 the Head of the World Health Organization, Margaret Chan has said that, “Air pollution is one of the most important health risk factors globally, comparable to tobacco smoking”. She was commenting on a report from the Lancet, the world’s foremost medical journal, that highlighted the risks of air pollution from fossil fuels. The Irish government's Environmental Protection Agency states that air pollution is directly linked to 1,200 premature deaths per year mainly around large cities and towns as a result of traffic emissions. Most Revd Dr Michael Jackson, Archbishop of Dublin and Glendalough can lead a revolution in the Church of Ireland, and it might be inspired by the Pope. The revolution I am talking about is to do with mission. The signals are that the archbishop has been thinking long and hard about mission and Christians’ responsibility to care for creation. He likes to use the term 'theological ecology', for it sums up what creation care is all about: humankind’s relationship to God and to the world. Archbishop Clarke on the refugee crisis. What about the causes? I was delighted to see that Archbishop Clarke gave a lecture on 25 May 2016 on the theme of refugees. His lecture was entitled ‘The Stranger at the Gate’ and focused on our response to the refugee crisis and displaced people across the world. The Archbishop addressed the size of the crisis and how we need to respond, but he did not mention anything about the underlying causes. Last week Exxon held its Annual General Meeting at which shareholder resolutions on Climate Change were defeated. Exxon has refused to approve resolutions on climate change since engagement first began in 1996. The world is going to have to continue using fossil fuels, whether they like it or not ... just saying ‘turn the taps off’ is not acceptable to humanity, This intransigence did not go down well with many of Exxon's shareholders, 38% of whom voted for change. The interesting thing is to compare the quote above with the RCB's policy on climate change. Here is an extract, fossil fuels will continue to contribute a major component of this energy mix for the foreseeable future and remain one of the most cost efficient methods of energy production. Whilst not as blunt as the CEO of Exxon, the similarity is striking. It is certainly good to see the Church of Ireland Representative Church Body (RCB) respond to the issue of climate change. 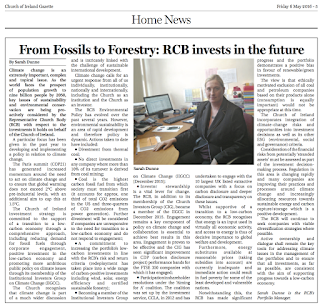 The article 'From Fossils to Forestry: RCB invests in the future' originally appeared in the Church of Ireland Gazette, 9th May 2016. It indicates that the ethics of fossil fuel investments are at the top of the Investment Committee agenda, which is good to see. Climate change is an extremely important, complex and topical issue. Stating that climate change is ‘complex’ sets the mood. It sets the scene that the RCB aims to steer through the rising seas and storms of climate change and chart the best course having weighed all the options. But opening an article in this way is a distraction, for climate change happening. There is no complexity to that fact.